When a company is named Monkey Business, you've got to figure that their products will be at least a little bit whimsical. 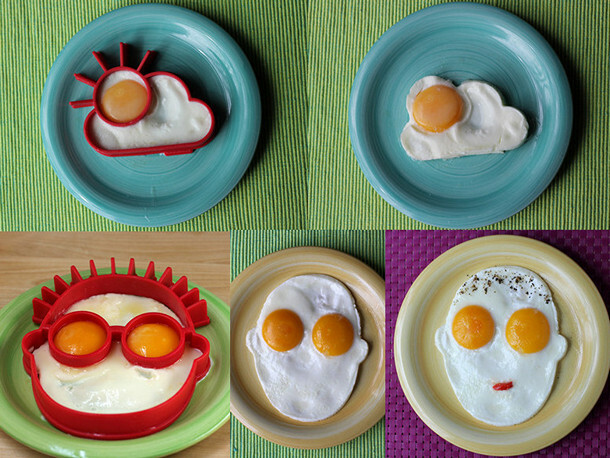 The Egg Shapers, ($14.99 for the face; $10.25 for the sun and cloud) are strictly for fun. Egg Shapers are silicone molds designed for cooking eggs, with appropriately-placed round holes to corral the yolks. They're easy to use - just crack the eggs into the mold and cook the eggs as you'd usually cook your sunnyside or basted eggs. I tried these with large, extra-large, and jumbo eggs, and found that the best results came from using extra-large eggs, particularly for the face - the whites have a lot of territory to cover. To get the most attractive face, I found that separating yolks from white first, then pouring the whites into the mold followed by the two yolks for eyes worked best. The instructions suggested oiling or buttering the insides of the molds for easier egg-release, but I didn't bother with that, and they came out just fine. It helps if you've got a large spatula to move the face - it's pretty big - or you can carefully slide it onto a plate. After that, it's up to your creative self to decorate the eggs - or not. I went minimalist, with some ground pepper for hair and a bit of roasted red pepper for a mouth. But you could certainly go wild if you wanted to. Or let the kids run amok with vegetables, cheese, and other additions to make breakfast a little more interesting. And then send a breakfast sausage missile into the sun and blow it up. Or poke someone in the eye. It's all in good fun. The egg shapers are dishwasher safe.